Polyarteritis nodosa in a 47-year-old man with abdominal pain, weight loss, and an elevated erythrocyte sedimentation rate. Right renal arteriogram reveals multiple microaneurysms within the upper pole of the kidney on this selective right renal artery injection (upper pole branch). Polyarteritis nodosa. Superior mesenteric injection in a 56-year-old woman with arthralgias reveals a few small microaneurysms. The differential diagnosis includes Churg-Strauss disease, Churg-Strauss syndrome, leukocytoclastic vasculitis, systemic lupus erythematosus, and Wegener granulomatosis. Other conditions that should be considered are acute glomerulonephritis, drug-induced vasculitis, and vasculitis associated with lupus, scleroderma, rheumatoid arthritis, and Wegener granulomatosis. Transcatheter embolization should be considered only in cases involving larger aneurysms, because of the potential for rupture, and when bleeding occurs from rupture of the aneurysm. Chest and abdominal radiographs on a previously healthy 24-year-old female student who presented with a sudden onset of right upper quadrant pain. 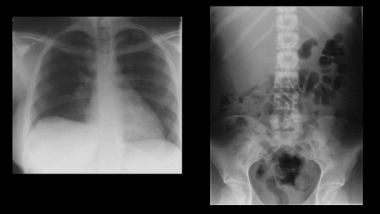 Note the elevated right hemidiaphragm with a fuzzy superior surface and a suggestion of mass in the upper left quadrant on the abdominal radiograph. Axial contrast-enhanced CT scans and digital subtraction celiac axis angiogram of the same patient as in the previous image. The axial CT scans show an ill-defined mass in the liver under the right hemi-diaphragm associated with a right basal effusion. The angiogram show multiple micro-aneurysms within the liver. Selective arteriography is the best modality for evaluating and diagnosing polyarteritis nodosa. 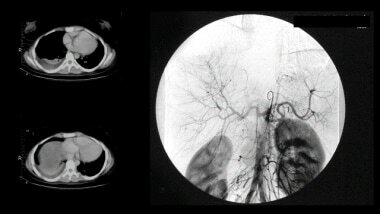 The most striking pathognomonic finding is the appearance of aneurysms, usually microaneurysms, which are believed to be caused by rupture of a vessel wall (see the images below). Microaneurysms are often multiple, usually numbering 10 or more in any single visceral circulation. In most patients, they are 2-5 mm in size. Saccular aneurysms (1-5 mm) of small and medium-sized vessels are typically found. Usually, microaneurysms can be identified in 60-80% of patients, and although they are considered to be pathognomonic for polyarteritis nodosa, these lesions can be encountered in other vasculitides. The aneurysms are caused by segmental occlusion of the arteries with weakening of the arterial wall, which occurs as a result of the necrotizing inflammatory process. The most common sites of involvement of polyarteritis nodosa are the branching points and bifurcations of arteries. Common sequelae of this condition are intravascular thrombosis, aneurysm rupture, and arterial occlusion with resultant infarctions. In the kidneys, these sequelae can cause ischemic atrophy and hemorrhage. The hemorrhage is usually intrarenal, perinephric, subcapsular, or retroperitoneal. Although angiographic findings of microaneurysm, ectasia, and/or occlusive disease suggest the diagnosis of polyarteritis nodosa, these findings may be seen in other vasculitides, including rheumatoid vasculitis, Churg-Strauss syndrome, necrotizing angiitis associated with drug abuse, and systemic lupus erythematosus. Correlation with the clinical evaluation is important. Conn DL. Polyarteritis. Rheum Dis Clin North Am. 1990 May. 16(2):341-62. [Medline]. Jayne D. Challenges in the management of microscopic polyangiitis: past, present and future. Curr Opin Rheumatol. 2008 Jan. 20(1):3-9. [Medline]. Cengiz N, Demir S, Parmaksiz G, Temiz AK, Noyan A. Polyarteritis nodosa: a case presenting with renal mass. Eur J Pediatr. 2012 Dec. 171(12):1859-60. [Medline]. Ewald EA, Griffin D, McCune WJ. Correlation of angiographic abnormalities with disease manifestations and disease severity in polyarteritis nodosa. J Rheumatol. 1987 Oct. 14(5):952-6. [Medline]. Hekali P, Kajander H, Pajari R, et al. Diagnostic significance of angiographically observed visceral aneurysms with regard to polyarteritis nodosa. Acta Radiol. 1991 Mar. 32(2):143-8. [Medline]. Stanson AW, Friese JL, Johnson CM, et al. Polyarteritis nodosa: spectrum of angiographic findings. Radiographics. 2001 Jan-Feb. 21(1):151-9. [Medline]. McWilliams ET, Khonizy W, Jameel A. Polyarteritis nodosa presenting as acute myocardial infarction in a young man: importance of invasive angiography. Heart. 2013 Aug. 99(16):1219. [Medline]. Jee KN, Ha HK, Lee IJ, et al. Radiologic findings of abdominal polyarteritis nodosa. AJR Am J Roentgenol. 2000 Jun. 174(6):1675-9. [Medline]. Ozaki K, Miyayama S, Ushiogi Y, Matsui O. Renal involvement of polyarteritis nodosa: CT and MR findings. Abdom Imaging. 2008 Mar 4. [Medline]. Howard T, Ahmad K, Swanson JA, Misra S. Polyarteritis nodosa. Tech Vasc Interv Radiol. 2014 Dec. 17 (4):247-51. [Medline]. Higuchi T, Sugimoto N, Hayama M, Tanaka E. The usefulness of 3D-CT angiography in polyarteritis nodosa. Intern Med. 2012. 51 (11):1449-50. [Medline]. Axial non-contrast CT scan through the liver on 36-year-old female patient with known Systemic Lupus Erythematosus who presented with a sudden onset of right upper quadrant pain and a drop in hemoglobin. A contrast scan was not undertaken at the time because of a raised EGFR. Note the peripheral crescentic mixed attenuation along the lateral surface of the liver secondary to a hematoma. 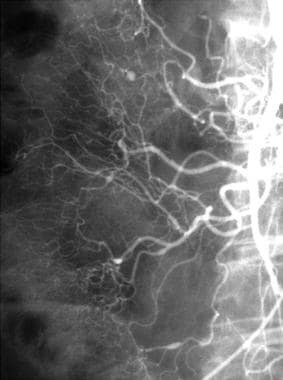 A celiac axis angiogram shows multiple micro-aneurysms within the liver and relatively hypovascular area due to a hematoma. Angiography was carried out to (or “intending to”) embolization of bleeding point. The procedure was not done as there was no active bleeding. 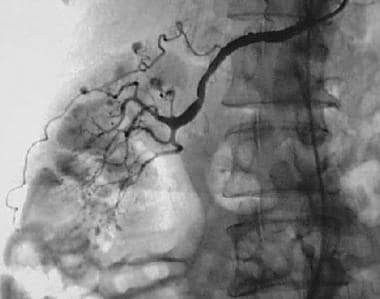 Hepatic angiography shows a bleeding microaneurysm in polyarteritis nodosa. Note hematoma in the peripheral right lower edge of the liver. The next figure shows pre-and post-embolization in superselective hepatic angiography. Superselective hepatic angiography in polyarteritis nodosa shows post-embolization angiogram indicating a cessation of bleeding.